In the interest of your own sanity, I’m going to say that you should only keep reading this if you have bacon in the house, or if you are willing to go to the store right now. You might feel hungry and wistful, and I just can’t take thinking of you that way. So don’t read any more. Okay. Whoever is still with me, you’ve got some bacon, right? Let’s move on, then. 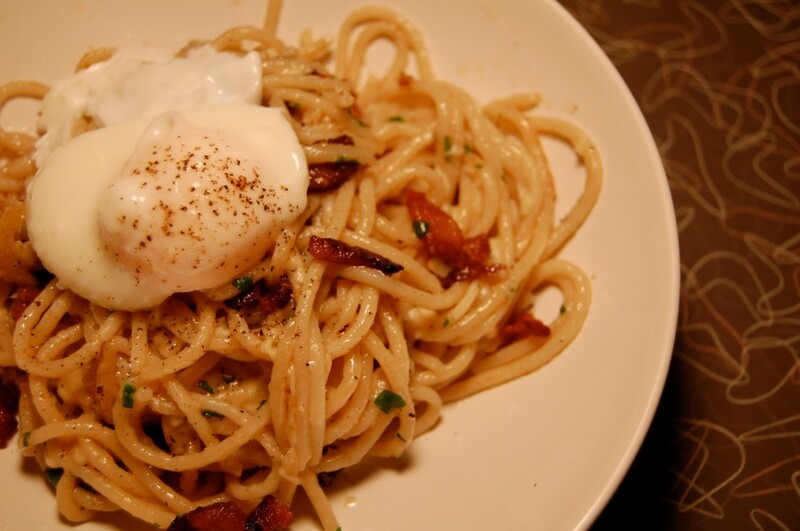 This is peppery pasta carbonara with poached egg, or in other words, spaghetti with bacon, cheese and egg all cooked in bacon fat and butter. You can make this very fast, so don’t worry- you’ll be eating it in no time. I’m just going to give you a few hints to get you going. Because this all comes together so fast, you want to have your ingredients ready. 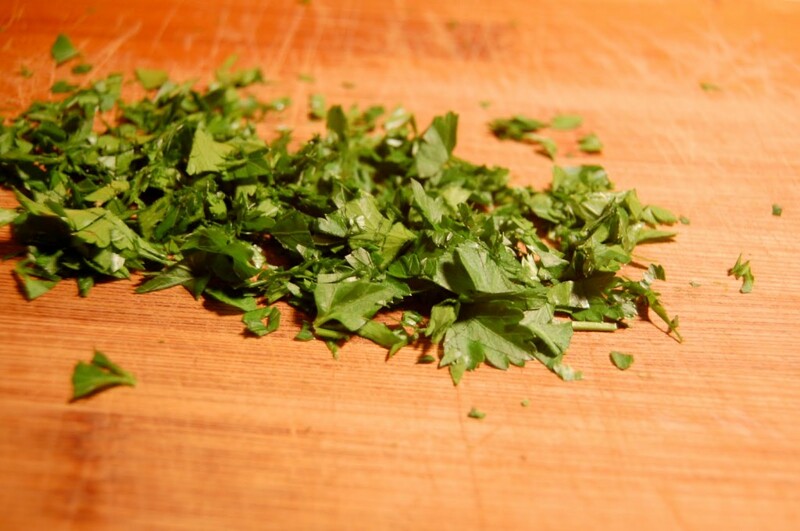 Chop your parsley, grate your cheese. Put it in little bowls on the counter. One more thing- and don’t give up on me now. You have to poach an egg for this. Some of you poach eggs every day and smugly eat them on toast. I do this too, but only recently. You’re not phased by this egg poaching. But maybe others are not so comfortable with poaching an egg, and that’s okay- you will be a member of the egg poaching club before the night is through. Use a low sided sautee pan, if you have one. (For this recipe, you’ll be cooking the egg in the pasta water, so whatever pot you used is fine too. ) Fill it 3/4 full with water. Add 1 Tablespoon of white vinegar and a bit of salt. Bring the water to a simmer. That means little bubbles, a fair amount of steam. 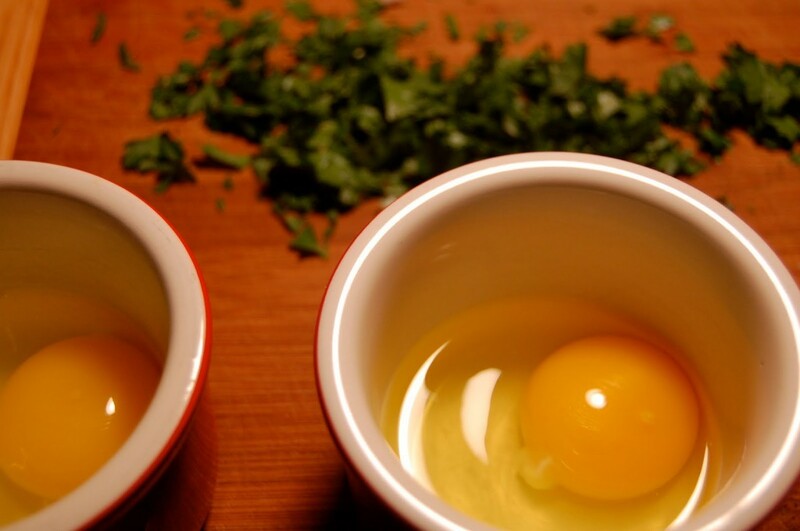 Crack your egg into a little ramekin or bowl. Hold the bowl right over the water, and slip the egg into the water. The egg will swirl around, and you might be reminded of the scary scene in Ghostbusters. The egg will come together. Cook the egg for about 2 1/2 minutes, then scoop it out. You can store it in warm water until the rest of the dish is ready. You are now a member of the egg poaching club. And now for the recipe. Cook bacon in a 10- inch skillet over medium heat until crisp. Transfer bacon to a paper towel. Meanwhile, cook spaghetti in a 4 qt. saucepan of salted boiling water. Reserve 1/3 cup cooking water, then transfer pasta with tongs to a bowl, shaking off excess water. If you are making this dish for more people, you might opt to drain the pasta and use new water for your eggs. That’s fine too. But if you choose to take your pasta out with tongs, keep the water simmering, and add a touch of white vinegar to it. Pour off all but 2 teaspoon bacon from skillet, then whisk butter into fat in skillet over medium heat. Add spaghetti, reserved cooking liquid, cheese, and a rounded 1/4 teaspoon of pepper and cook, stirring, until sauce has thickened, 2 to 3 minutes. Add bacon and parsley or tarragon and toss. Season with salt and pepper. Break egg into cup and slide gently into water. Poach at a bare simmer for about 2 1/2 minutes. Serve pasta topped with egg and extra cheese.